Miami Beach is known as the “it” place for high-end oceanfront condos. Fortunately, for buyers, there is currently a surplus of amazing condos on the market. Miami Beach is comprised of several neighborhoods, and these three wonderful condos are located in three of the most sought after areas – SoFi, the Faena District, and Fisher Island. 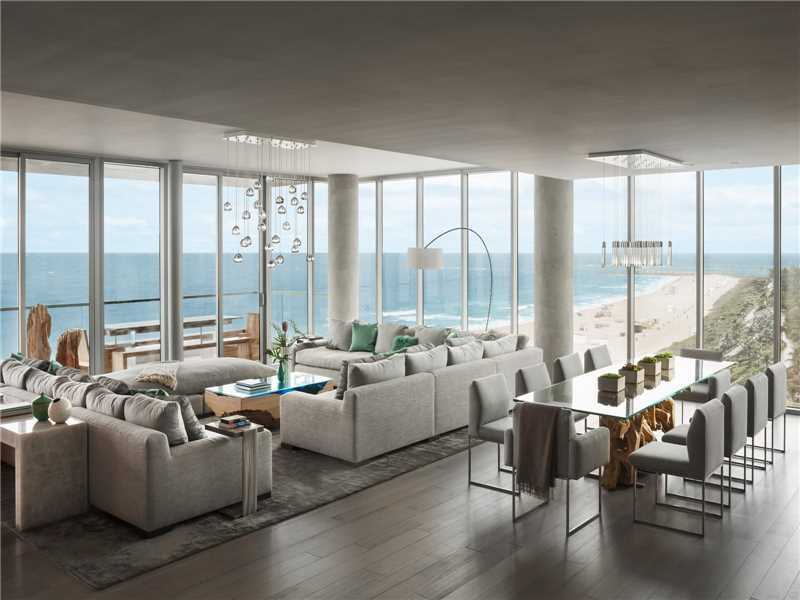 Take a look at the top 3 Miami Beach oceanfront condos currently on the market. One of South Beach Miami Beach’s hottest developments is 321 Ocean. This turnkey 2-story oceanfront penthouse located at 321 Ocean Drive # PH 900, Miami Beach, FL 33139 is absolutely stunning. This custom full floor penthouse is located on the 9th and 10th floors of the building and totals 13,220 square feet. This penthouse is located in the heart of the South of Fifth neighborhood. This gorgeous unit, in the most desirable South Beach Miami Beach neighborhood, has a flow through layout, which provides breathtaking ocean and city views from any of the 4 bedrooms, 5 full baths, and 2 half baths, as well as from the private roof top terrace that has a 36 foot infinity pool, a barbecue, a bar, and a lounge area. The unit showcases a chef’s kitchen with Miele and Sub-Zero appliances, a den, an office, a media room, and staff quarters. Listed at $39,500,000 PH 900 at 321 Ocean is the ideal oceanfront property for anyone who loves to live a luxurious lifestyle. The Faena District in Miami Beach is one of the most happening new micro-neighborhoods in Miami Beach. The Residences at Faena Hotel are some of the most sought out condos currently in Miami Beach. This distinctive oceanfront penthouse located at 3315 Collins Avenue # PH D, Miami Beach, FL 33140 is truly a designers dream. This custom penthouse was designed by the internationally renowned architects at Foster+Partners. This penthouse offers panoramic views spanning from the Atlantic Ocean to Biscayne Bay with glass walls throughout. This unit features a majestic outdoor terrace that wraps around the unit. The interior offers 7,710 square feet of living space, while the outdoor living space offers 2,011 square feet, totaling a living space of 10,621 square feet. The unit offers buyers 4 bedrooms, and 4.5 baths. Listed at $33,900,000 PH D at The Residences at Faena Hotel is a great purchase for anyone looking for a full-service residential building that offers exclusive access to 5-star hotel amenities. Fisher Island, located just across Government Cut from South Pointe Park, is a luxurious private island that offers high-end condos and townhomes. This gorgeous Italian turnkey condo located at 7053 Fisher Island Drive #7053, Fisher Island, FL 33109 is perfect for families. This model unit, floor plan E, comes totally furnished with Henge Italian Furniture and Roda outdoor furniture. This Fisher Island stunner showcases Listone Gioradano wood floors throughout and Apure Porsche design lighting. The interior offers 9,826 square feet of living space, while the outdoor living space offers 1,797 square feet, totaling a living space of 11,623 square feet. The unit offers buyers 7 bedrooms, 7 baths, an office, a media room, a den, a breakfast nook, a staff office, and more. Listed at $19,700,000 7053 Fisher Island Drive is a great buy for anyone seeking privacy, as the island is only accessible via ferry or boat, and the condo has a private elevator entry. If you are interested in calling any of these opulent oceanfront Miami Beach condos home, contact us at pobiakproperties.com. Here at Pobiak Properties, we will help you purchase the condo of your dreams, and stick by your side to offer you the best concierge services around, so that you never have to worry about the status of your property while you are away. This entry was posted in Fisher Island, Lifestyle, Luxury Condos, Miami Beach Lifestyle, Miami Beach Luxury Real Estate, Miami Beach Neighborhoods, Miami Beach Real Estate, Miami Beach Waterfront Condos, Miami Beach Waterfront Neighborhoods, SoFi, South Beach, South of Fifth and tagged Concierge Service Miami Beach, Fisher Island, Fisher Island Miami Beach, Luxury Real Estate, Miami Beach condos, Miami Beach Luxury Real Estate, Miami Beach Oceanfront Condos, Pobiak Properties, SoFi Miami Beach, South of Fifth Miami Beach, Turnkey Service Miami Beach on February 15, 2017 by Giancarlo Bobbio.